BBC:- The UK’s July temperature record could be broken on Friday despite the arrival of storms in parts of the country. The Met Office told the BBC to expect highs of 37C (98F), meaning the record of 36.7C, set in 2015, may be beaten. The weather has already led to travel problems – with both the Eurotunnel and Network Rail reporting disruption. The public are being urged to take care while swimming, after police were called to incidents in rivers, lakes and near piers across England. 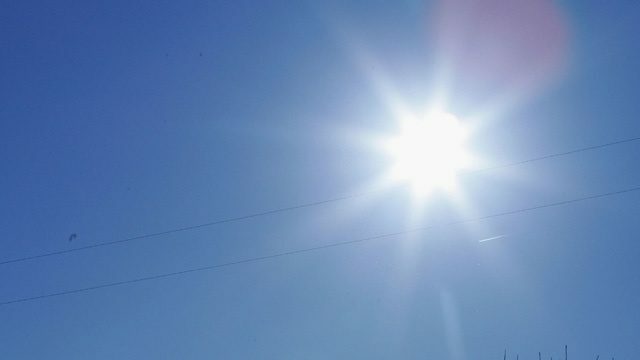 Forecasters had said the UK’s all-time record of 38.5C could be passed on Friday, but those estimates have been toned down following overnight storms. More storms are expected from 14:00 BST, with a yellow weather warning issued for the east of England. Eurotunnel passengers are enduring delays of about two hours at the terminal near Folkestone in Kent – after problems with air conditioning in carriages. The firm said it had taken an “unprecedented decision” to cancel thousands of day trip tickets for Friday to ease the long queues. Rail services on the East Coast mainline have also been disrupted after lightning strikes damaged signalling. London North Eastern Railway (LNER) advised passengers not to travel on Friday “due to the extreme weather conditions and signalling failure throughout the route”. All services between Leeds and York have been stopped. And Network Rail said speed restrictions remained in place for some Chiltern Railways, Northern and Greater Anglia services, amid fears high temperatures could cause the tracks to expand and “buckle”.